MICHAEL NOONAN HAS hit out at suggestions that Fine Gael got its figures in relation to the fiscal space wrong, challenging his critics to prove their claims. The Finance Minister was speaking in the wake of the controversy that has emerged after he previously stated that €12 billion in “new budgetary commitments” would be available to the next government over the next five years. The row over the fiscal space – the amount of money that could be available to the next government to cut taxes and increase spending on public services between 2017 and 2021 – has dominated the opening days of the general election campaign. The €12 billion, a figure that was also initially used by Labour, has since been revised down to €10.1 billion by both government parties, while Fianna Fáil and Sinn Féin say the fiscal space is only €8.6 billion. Labour is privately admitting that it double-counted €2 billion. Fine Gael, however, has maintained its figures were always correct with Noonan saying today that the €2 billion had already been set aside to honour the Lansdowne Road Agreement on public sector pay as well as capital spending projects. Noonan became increasingly irked as he addressed the matter at a press conference in Dublin today, telling reporters: “First of all, the comments that my figures don’t stack up, that’s not correct. I totally and completely stand over the figures. Anybody who objects to these figures, who casts doubt over these figures, they now have an obligation to put the evidence forward because assertions that I’m wrong cut no ice. Prove it, prove it! “Any of the media that are still asserting that the figures are incorrect put the evidence under it because there is no evidence produced yet, it’s just a series of assertions. I completely and utterly stand over the figures, they’re fully costed. I think from my point of view they are very easily understood if you just look at the numbers. It’s not high maths, it’s simple arithmetic and we stand over the figures, they’re the figures that have consistently come through from the Spring Statement to the Budget. Well I don’t know what the full phrase was. I don’t remember the phrase, but if I said it’s ‘new budgetary commitments’ it means that in each individual budget it has to be committed because that’s the way the system works. The government decides on an annual basis what will be spent and the budget is announced in the norm. So even though the €2 billion was committed in the Lansdowne Road [Agreement] and the capital programme, in legal terms it has to be committed in each Budget. He said he did not think Labour had its figures wrong but said “they’re expressing themselves in a different way” and that others are listening and “getting confused on the figures”. Noonan was speaking as Fine Gael outlined its plan to abolish the USC over five years if re-elected to government with proposals to implement a 5% tax on people earning over €100,000 as a so-called claw back measure. I think those who didn’t realise already that, as they now knock on doors, this is easily the most hated tax in the country. He said that the abolition of USC would get the marginal rate of tax for low and middle income earners down to 44% with it reduced to under 50% for everyone else. He said that even with the 5% claw back everyone stands to benefit from the scrapping of USC. Fine Gael also announced plans to reduce the threshold at which PRSI is paid to €13,000 with a €10 weekly PRSI credit. As part of this dental benefit, which limits fees for dental work, will be reintroduced. There will also be paid paternity leave and increased jobseeker’s benefit for the first three months after a person loses their job before it is tapered down to the standard rate, according to Fine Gael’s plans. Fine Gael also said it intends to increase the minimum wage to €10.50 per hour by 2021. At today’s event, Noonan claimed that a teacher, nurse or guard earning €40,000 a year would be €800 worse off under Sinn Féin’s tax plans. Read: What is the ‘fiscal space’ and why does it matter? Email “'Prove it, prove it! ': Noonan blames media and insists he didn't get his maths wrong ”. Feedback on “'Prove it, prove it! 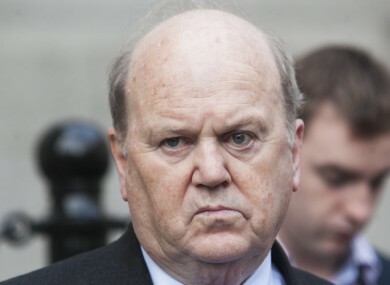 ': Noonan blames media and insists he didn't get his maths wrong ”.